Maxi Moralez hugging David Villa after scoring a goal on Sunday night. USA Today Sports. 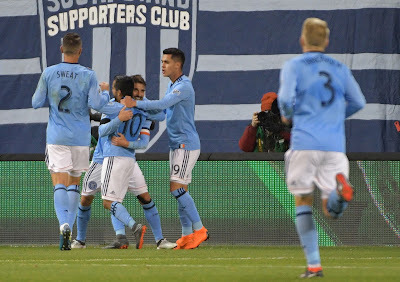 New York City Football Club opened their fourth season in style, as they earned a 2-0 win on the road at Sporting Kansas City on Sunday night. NYCFC had a strong season last year, as they earned a second-place finish overall, but fell in the playoffs to Columbus. NYCFC came out strong, getting their first big chance in the 15th minute when Rodney Wallace got to the byline and curled in a cross which only just missed Jesus Medina and David Villa in the middle. In the 20th minute, Alex Ring tested Sporting KC goalkeeper Tim Melia with a fierce dipping strike from distance. It wasn't long before the first goal of 2018 would arrive for NYCFC from Maxi Moralez, who is entering his second season in New York. The play in the 31st minute began when David Villa dipped his shoulder, charged down the left side and he fired a pass for Moralez, who slid in to bury it to make it 1-0. Moralez scored five goals last season for NYCFC, so he is picking up right where he left off, showing off the chemistry between him and Villa. NYCFC had another huge chance in the closing seconds of the first half when Villa and Ben Sweat broke clear with 40 yards of space and no defenders ahead of them, with only the goalkeeper to beat. With Sweat ahead of the Spanish striker, the pass wasn't on and Sporting KC defender Christian Lobato was able to make a heroic sprint back to intercept and keep Kansas within a goal going in at the break. 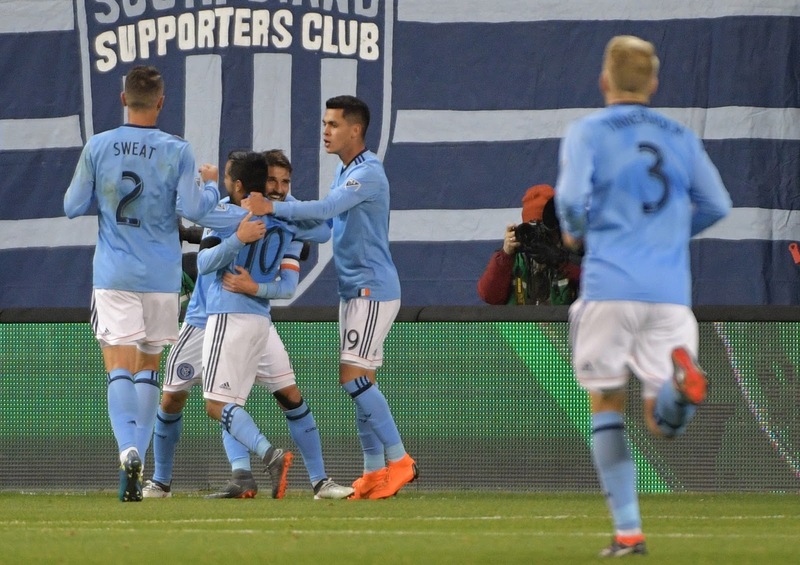 In the second half, it didn't take long for NYCFC to double their advantage and it was the new Designated Player who made his mark in his debut. Jesus Medina was at the end of the chain to deliver an impudent lift over Melia for 0-2 but the move that went before it was just as good as the finish as NYCFC broke at pace, overloading the left side, allowing Sweat to pick out the Paraguayan international Medina with a perfect cross. As NYCFC looked to be coasting towards victory, there were two moments of VAR-related drama in a frenetic final ten minutes as referee Mark Geiger pointed to the spot following a challenge from NYCFC defender Maxine Chanot, but the cheers inside the stadium soon turned to heckles as the replays showed the Luxembourg international won the ball, meaning the decision was reversed. Chanot was spared on that occasion, but in the 88th minute, he was shown a straight red card on review for denial of a goalscoring opportunity for Fernandes. As a result, NYCFC knew they would have to step it up on defense for the final five minutes, and they did to close out the win. NYCFC's home opener is this Sunday, March 11th at 5:00 pm at Yankee Stadium against the LA Galaxy, who also won their season opener as they beat the Portland Timbers 2-1 on Sunday night.